Our initial project was to have women in Nepal take folic acid to prevent birth defects. We wanted to educate Nepali people about the importance of micronutrients (MN) in their diet. 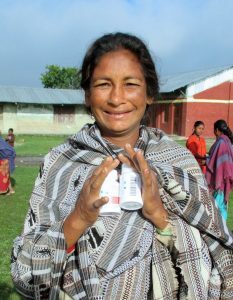 We proposed a system in Nepal to distribute supplemental folic acid in the form of prenatal multivitamins to women of childbearing potential in order to prevent neural tube birth defects. The additional MN in the multivitamin might also help anemia and other deficiencies. By 2009, Dr. Long and GNE had identified local resources in Nepal and partners in the project. The Nepal government was willing to let GNE do a research study on women’s health and the effect of prenatal vitamin supplements. Nine districts were selected for study based on local leadership and accessibility in Myagdi and Nawalparasi. Vitamins were provided by Vitamin Angels of Santa Barbara, CA. Bi-annual trips were arranged through Narayan Bhandari, trekking guide and so much more. 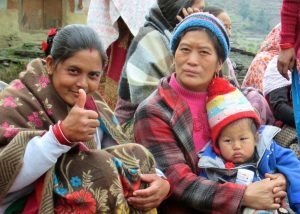 September 2011 to October 2014: Micronutrient Distribution & Research Project “Multivitamin and mineral supplementation in women of childbearing age and assessment of perinatal outcome in Nepal." 50,000 women in 9 locales received 200,000 micronutrient supplements and nutrition education. Local leaders and female community volunteers were trained to provide flip-chart and electronic tablet nutrition education (benefits of proper nutrition and prenatal MN supplementation). An important part of this project was also developing educational materials that would be used by the FCVLs to teach their village about nutrition. The typical diet in Nepal of dal (lentils) and bhat (white rice) is deficient in folic acid and other MN. Sources of folic acid available to local people needed to be identified. The information had to be presented in an understandable manner in Nepalese. We developed a flip chart in a printed form and a PowerPoint presentation with audio in Nepalese for an electronic tablet. We left these with the FCVLs. At this point GNE felt that we had demonstrated that vitamins could be imported and distributed by local village programs with enthusiastic acceptance. We had educated the people about the importance of folic acid and empowered them to improve their health. We wanted to expand the programs.